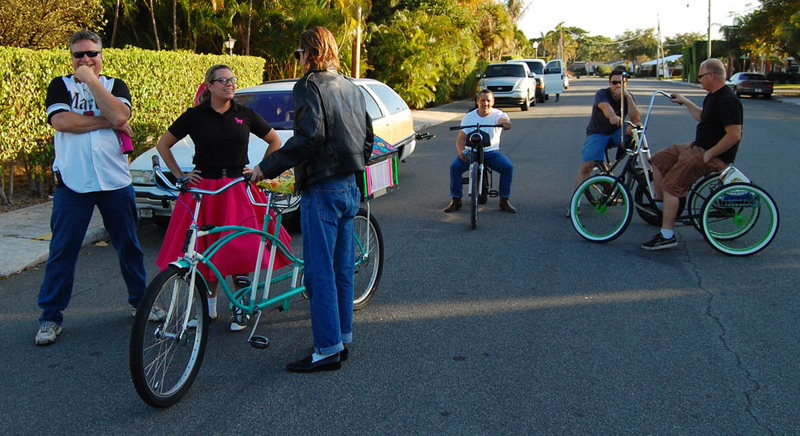 The Freakbike Militia’s 50’s Cruise from Flagler and Southern in West Palm Beach was supposed to leave in two waves: one at 5:30 sharp and the other at 6:30 sharp. I arrived a 5:20 to find myself all alone. I wasn’t sure if I was early or late. I took off down some residential streets for a ride, figuring that miles is miles. When I circled back around 6 PM, I found a small group gathering a block west of the announced meeting place. This was either my group, or I had taken a time travel to the 50s. It turned out that the normal start time is 7:30, so most riders aren’t used to showing up that early. The 5:30 wave was a wave-off since I was the only one to show. Since I was wearing my normal glow-in-dark bike jersey and bike shorts, I had a few folks look at me sideways. The group swelled as it headed north on Flagler drive, taking up the whole northbound lane. Even though a few cars were backed up, everybody seemed to take the delay in good humor. 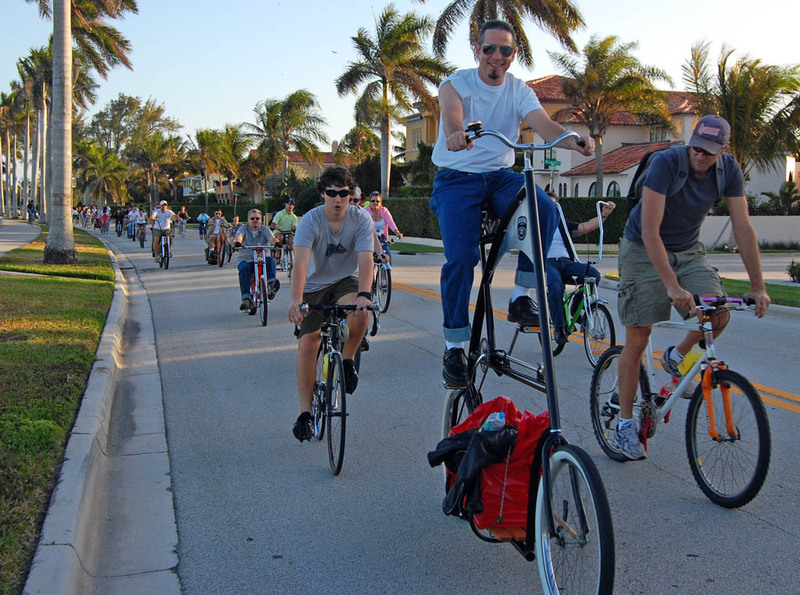 It dawned on me that this is about as close to a Critical Mass Ride as West Palm Beach ever sees. Some of the bikes are engineering marvels, some of them are rolling pieces of art. 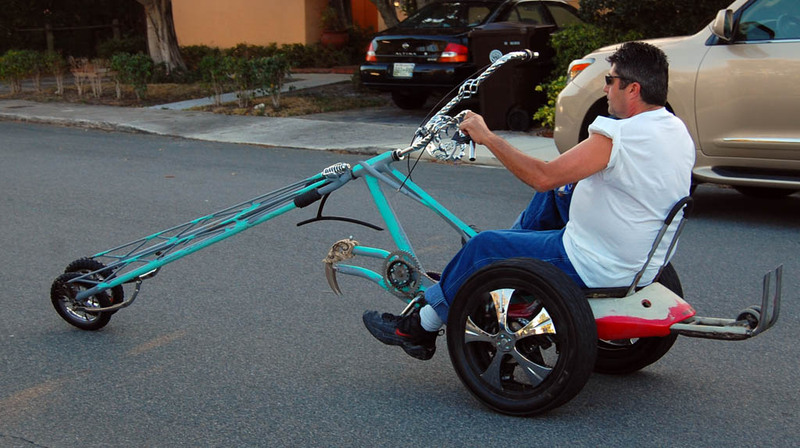 I’ll be posting examples of some of the more unusual bikes in the next few days. In addition to the 50’s music (and a good selection it was), there was the constant ding-ding of bike bells and the beep-beep of horns. Fishermen, joggers and non-participating riders responded good-naturedly. I’m still video-challenged, but I’m giving it a shot. In the interest of full confession, I didn’t realize the camera was still running when I shot this sequence. By the way, my sprint to get to the front of the group looks faster and scarier than it was. No bicyclists or motorists were harmed in the making of this movie. Uploading it to YouTube causes a severe quality hit (not that West Palm Beach’s bumpy roads helped any). I thought I had built a fairly secure camera mount, but it didn’t hold up well against potholes and traffic calming devices. I beefed it up today and will post pictures of the mods if it works when I ride this weekend. West Palm Beach Mayor Frankel showed up at the ride’s finish, but mayors pale in comparison to a King brandishing his staff from the comfort of his chariot. About a mile north of here, I heard a snapping sound and the chariot drifted slowly off the road. I don’t know which snapped, the chain or the chauffeur. 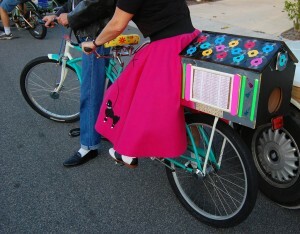 Speaking of riding in skirts, a couple of gals in Birmingham have started a blog called Bike Skirt to celebrate their bike riding. Interesting reading. At first I thought it was a gimmick because their photos looked more like a fashion shoot, but the more I read them the more I think they might be real deal bike commuters. Jack the Bike Man has been working with the poor and immigrant communities since 1999 when he came to the aid of a Spanish-speaking young man whose brakes were broken. Since then he’s extended his outreach in many different directions, although most of us in the community think of him in terms of fixing up broken old bikes. While we were passing near the city library, I heard one guy tell another that the tires on his borrowed bike had some kind of funky valve stem so he couldn’t get them aired up. Assuming that he had Presta valves, I asked if he needed some air. This would have been a great opportunity to try out my new Topeak Road Morph pump, but I gave the flat a shot of CO2 to save time. The tire was still a bit soft, but it was good enough to catch back up to the main group. 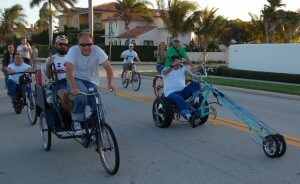 The ride ended at the Northwood Village Street Party where everyone milled around admiring the cool bikes. My Surly Long Haul Trucker attracted a fair amount of attention. Even hard-core bike modifiers hadn’t seen anything like it. While I was shooting this video of the arrival, a woman walked up and asked what this was. YouTube cuts my answer off, but I replied honestly, “I’m not sure what you’d call it. Looks like a fun group to get to know for several reasons…they enjoy biking, they have a great sense of having fun (demonstrated by their bikes) and they didn’t poke you with a stick. Glad you put out the warning about how the video looks a lot more scary (at 3.06 in) as you begin to pass everyone and make the cars squeeze over, I wasn’t sure that was you riding that breakaway, where did you get the get-up-and-go from? Check out this link to the WPB chapter of the Freakbike Militias ‘coming events’ thread. I update it AT LEAST once a week! Previous PostPrevious Space Shuttle Launch Postponed, Darn It!